Well, I can’t really do an “End of October” post yet, because as I type this, my town is currently behind: on October 17th. I have a reason for being behind, which I’m excited about, and will go into more at the bottom of this post. But I was also excited about getting to experience the Halloween festivities in AC:NL in real-time after all, thanks to Ryann of Shantaki coming to the rescue! Right away she led me over to a pile of goodies she’d ordered for me, items I’d been wanting from the blue and alpine series. Thanks so much, I’ll put them to good use in my characters’ houses! Of course, I had some things for her as well. While Ryann and I were trying to sort out our gift exchanges, Opal came up to me all of a sudden for my first trick-or-treat encounter! I was expecting a prize or something, but all she had to give was information — very uncertain information, at that! When you scare a villager indoors with the right mask, they give a lollipop. I was pretty clueless going into this, so I ate my first lollipop and gave my second one to a villager, but what you’re supposed to do is give them to Jack in exchange for an item of the creepy set. In addition to rock-paper-scissors, charades is another game you can play with a villager if you don’t give them candy. Unlike the random chance of rock-paper-scissors, it’s not hard to figure out what the right answer is in charades from the choices given. I got a pumpkin mask from Chief! 😀 It’s supposed to be a punishment for when you lose a mini-game of rock-paper-scissors or charades, like when your clothes turn to rags, but I think they’re pretty cool! When I catch up to Halloween in my town, if anyone’s interested, I might consider opening my gates for some who need a second chance to get the exclusives! As I mentioned at the top of the post, my town is still currently on October 17th. I want to catch up to the present, and will do so eventually, but it might be a slower catch-up than I originally planned. The grass and trees changed to a beautiful gold color on the 17th, and for the first time this Autumn, it’s a grass color change that I actually really like. (I didn’t like the pea-green color it was before.) The gold has inspired me to try making some changes to my town, if I can, like planting new trees and maybe even making new patterns. If I just speed up to the present time, I wouldn’t get a chance to do this, since I think on November 1st the trees change a darker orange-ish color (which is fine… but it’s not gold). For the flowers-on-grass pattern, I’m not sure if I should try to have it match the current grass color, or if I should have the flowers on a grassy green background (since it’s just going on top of the pavement, anyway — it doesn’t have to “blend in” with anything). For some reason, I really like the idea of a path like this with elaborate patterns of stonework, lined with golden trees. I think it’d also look better with the muted colors of late Autumn better than my current vibrant paths. But obviously, it’s not done yet and still needs a lot of work! Just wanted to give a heads up on why I might not catch up for a while. Another thing that might slow me down is that Robin is moving out, so I’ll probably get the chance to move in another dream neighbor soon, and I’ll want to spend as long as it takes to get their house in the spot I want. I’ll try not to settle for a less-than-perfect spot this time. xP I’ve been working on building PWPs for house-repelling purposes in areas I don’t want houses to go, so hopefully that will help some. 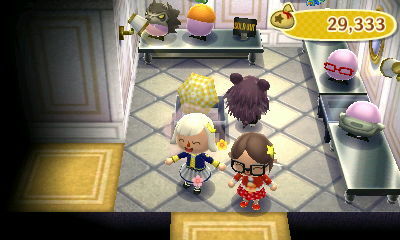 Posted on November 6, 2013 by Amy •	This entry was posted in AC:NL, AC:NL WiFi, Citalune and tagged Animal Crossing. Bookmark the permalink. I was pretty exited to celebrate halloween and I collected much candys. But a day before halloween I did a re-start of my town. But I guess it would maybe look great if you could combine your 2 path designs. I guess the greatest thing on your town is how colourful it is. I really loved by the way your candy theme in Dafdilly and watched this video really often. For my town I planned the same and wanted to create patterns for christmas. But Amy, I’m still lazy in fact of the qr-codes. It exist so pretty patterns I could scan! Do you feel sometimes the same? I hope you’ll be happy with your new town! That’s sweet about naming it after and re-creating aspects of it after your Wild World town. 🙂 I still have affection towards Wild World and my town as well, and it makes me sad that I don’t really get the chance to play in Dafdilly much anymore like I used to. I still turn it on sometimes — always on the same date, though. Thank you! Yeah, I feel like I’ll miss the vibrant effect of the mosaic path, and how it coordinated with the hybrid flowers and fairytale PWPs. But I’m interested to see how the fairytale bridge-inspired path turns out. ^^ I’m planning on adding a border to the path, so hopefully I can incorporate a touch of color there. Ooh, I like the idea of alternating cedar and apple trees, that would look lovely! I’ve been stocking up on cedar saplings so hopefully I can make good use of them this winter. Yeah, it makes me sad as well. 😦 AC:WW was how I started off this blog, so I’ve kind of ‘abandoned my roots’ a bit, so to speak. I wish I had lots of time to dedicate to both games, but I have to focus on my education and such as well. AC:WW is unfortunately a little more high maintenance for me because of all the flower-watering, but it’s still such a charming game. At first: I don’t wanted to reply this comment anymore, because I don’t want to write too much. But I really need your help and hope you can help me! And I wanted to ask you if you have an idea how can I match this in New Leaf. Oh, and my next problem is: In Wild World I created the path really simple and straight with a few colours, but in New Leaf it looks so awkward without details, but I have no idea how can I make it to look real. Also maybe that a stone cames out and looks more natural. Maybe you have a few tricks? I think your observation about transferring Wild World patterns to New Leaf is unfortunately spot-on. It’s not just the palette colors that are different, but the graphics, aesthetics, and overall look of New Leaf is so different from Wild World that most paths/patterns made for Wild World will look simplistic and out of place in a New Leaf town, at least compared to patterns specifically made for New Leaf towns. 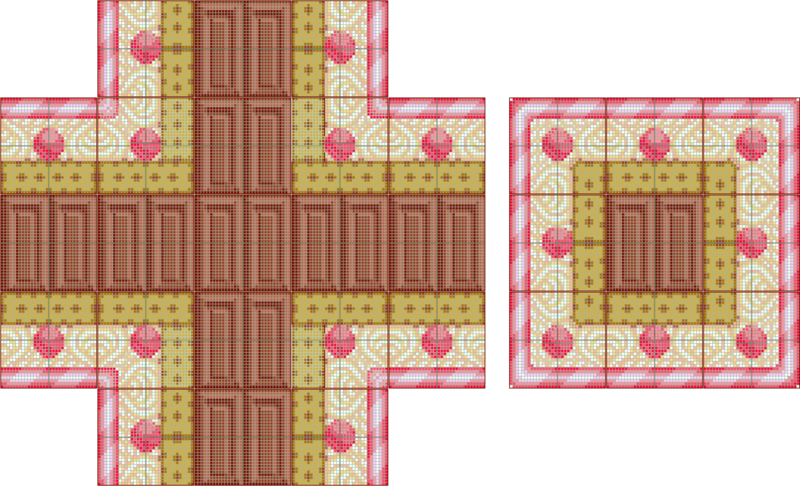 But I do think that you could maybe create a candy path for New Leaf with elements that are similar to my old path for Wild World (if that’s what you’re asking — sorry if I misunderstood!). Adding more detail to patterns is easier in New Leaf now that there are more palette options, so make sure to pick the best colors needed to create the candy patterns. Often times you’ll pick a base color for an object, then a lighter version of the same color for highlights, and a darker version of the same color for shading. This will help make objects look 3D if you determine a “light source” and shade the objects accordingly. 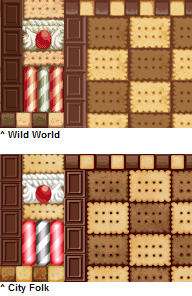 I mostly used the wallpaper and carpet for inspiration, but I also thought it would be cool to draw inspiration from the sweets furniture, like having gingerbread cracker benches around town. (Didn’t end up doing that, though.) 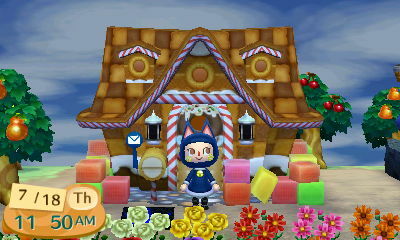 In New Leaf, something you could draw inspiration from are the new candy-themed house parts. 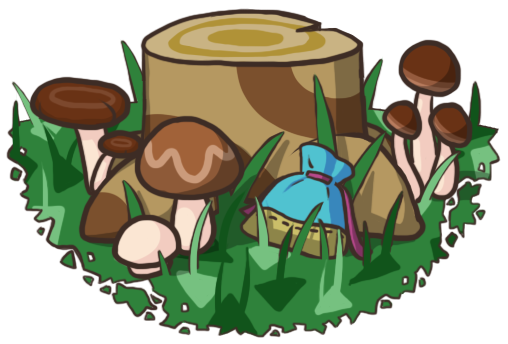 You can also draw from sources from outside the game, like googling different kinds of candy — or the boardgame CandyLand, like I did 😛 I drew inspiration from Lollipop Woods and Peppermint Forest for parts of my town. There are also ice creams, gumdrops, cookies, cupcakes, gingerbread houses, etc. Looking at pictures of these candies and trying to replicate them in a pattern — with maybe a grass, snow, or candy-ish background — could be a good way to go about it. 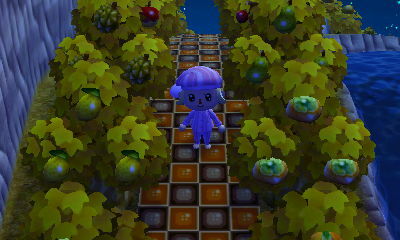 The cream parts of the path would especially need a lot of updating with New Leaf’s palette colors, though. Wow, I miss the golden grass and trees already! The orange doesn’t really fit with my town paths, but at least (I think) there’s a design color that mostly matches it? I can’t remember exactly which color it was, but it was one of the darker oranges on the palette. I can’t wait until December comes and there’s snow on everything – it should make the town paths I have in mind look less out-of-place. Your fairy-tale bridge path looks nice so far! I’m currently torn between sticking to my simple paths (that only take up two spots in my design space) since I can’t exactly make my second character the pathkeeper, or using my new third character to store more complicated paths. If you don’t already have the green-pumpkin head or the old wallpaper and flooring and want them for your catalog, or if you just want to see my town during the daytime, then I can give you one of each (I can PM you my Friend Code since I’d rather not have it public). I’m really looking forward to snowcover as well! I think it would fit Citalune better than Autumn (especially Estel’s castle and garden, with all the white flowers). Thanks! 🙂 I think simple paths can look great as well, and the fact that complex paths take up so many pattern slots is kind of a bummer, but oh well. Wish more space for patterns could’ve been one of the improvements for this game. My FC is 3222-6062-4806 (and I have information about private messages in the “Contact” widget in the sidebar). The reason I did simple paths was actually because I read about and visited a town from Tumblr that used only two path patterns. 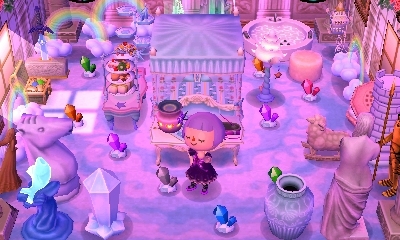 I liked the idea of having paths that I could just keep with Marina (right now I have two paths, three dresses I made myself, and five QR dresses I switch out when I get bored of them) – if you end up making Fern’s house a horror house (or one with any story to it), be warned it eats up a lot of pattern space! I definitely agree with the increased pattern space idea. Wow, I’m happy you loved my town! I’m actually trying to get more flowers (it’s probably noticeable in the area by my fountain). I also went into the game unprepared and picked the first town map available, planted trees in random places, etc. I didn’t even put much thought into the café location and just plonked it right where Tom used to live, but I’m happy with where it is now that Stitches moved in the convenient spot where he did. Anyway, I’m so glad you liked RainCity and I’m excited to get to see your town in person! I love how you would like to create a autumn theme in your town plaza. 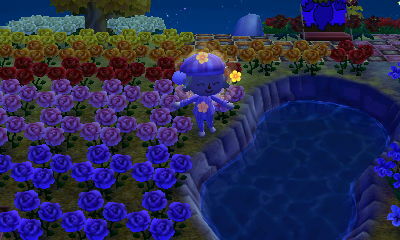 I think that gold roses and orange cosmos/roses/tulips would look very nice. :) Also, would you mind when your not busy to put your BFF connection thing on? I think our time zone difference gets in the way of us being online at the same time, but the next time we both are, sure! well, im sure we can work out the time difference, like for me right now its 8:58pm. Awww, like I said before when I visited, your town plaza is gorgeous with the gold trees and subtle green pears. It’ll be interesting to see how the forest clearing turns out 😀 Wow nice job with the patterns! I had to do a double-take to see what that grass picture was about, it blends so well. It’s probably not anything you would be interested in incorporating, but I kind of like that chequered effect too, between the patterns and the real grass. Aww, no problem! Halloween was very fun! 😀 Thanks for coming over! Aww, sorry to hear your mummy pants got ruined. My pajama hat and flipflops got ruined too! 😦 Also, I have jack-in-the-box, so that can’t be a good thing…(means I lost an item). It’s too bad that the gold doesn’t stay for very long, eh? It’s only like a solid 10-15 days that it’s here! Cos already the trees are orange! And that was today that they turned – November 10. Annndd it’s depressing that the town tree is dying! My sister noticed that today! Yeah, I guess it's the tree losing its leaves for winter. 😦 I like that the tree changes depending on the seasons, but I'll miss the full branches…it'll make the tree's plaza seem emptier.